Come and see the world from the perspective of a little lost cat, left behind when her owner moved. From a cat’s eye view, it’s all about the footwear! Every person this cat meets gets named according to what he/she is wearing on his/her feet. Slipper is looking carefully for a new owner. When she finally picks someone and follows her home, it turns out that she has made the perfect choice! Reviewers certainly differed in opinions this week. Some students raved. Others were a little more reserved. But all agreed – these illustrations were incredible! Hyo Min rates this book 5/5 and writes: I loved the book because there’s lots of details in the pages. How old is the girl with the shiny shoes? Why did the author make green eyes for the cat? This book was cool. How did the cat climb up the tree? Is Slipper (the cat) a boy or a girl? This book had a happy ending. It made me feel happy. Pheonix couldn’t commit to a rating. He writes: I like this book because there was a motorcycle. 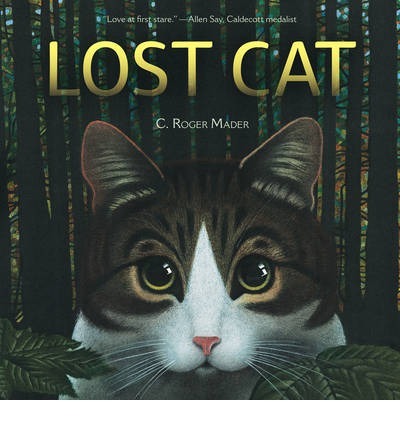 Soleen rates this book 5/5 and writes: Mr. Big Boots suggested to the cat that it should go to town and maybe he or she can find their owner. I like this book because it is interesting. The cat is really cute. I like the pictures. Is the cat a he or a she? Why does he/she call people by their shoes or boots? Giovanni rates this book 5/5 and writes: I gave the book 5/5 because I liked the picture that said lost. The reds and oranges are so nice. Joeli rates this book 5/5 and writes: Why did all the people have their shoes, boots, sandals, heel shoes as their last name? Because if you change your shoes, you will have to change your name. So you will have to wear them forever! Why did Slipper try to catch up? Because what happens if he does catch up but there is no pets allowed in there? Slipper should stay at home. When Slipper went to a guy with a snake on his boots, why did Slipper think that it is real? Look at the difference: the one on the boot is coloured yellow. Is Mrs. Fluffy Slippers a Grandma or a Woman? Why did the person with a motorcycle put Slipper inside a basket? Slipper might move a lot and he will fall down. This story has a happy ending. Vicky rates this book 5/5 and writes: My favourite part was when the cat followed the girl home and then when she got home, she showed her grandma who followed her home. How old was the cat? How old was the little girl? Maybe he will write another book that has an answer. Calvin rates this book 3/5 and writes: I like the part when the cat meets a man on a motorcycle and the cat jumped on a motorcycle. The man was riding and the cat jumped off. then the cat met a man with a semi. Sara rates this book 8/5 and writes: My favourite part was when Mrs.Fluffy Slippers was reunited with Slippers. I gave the book an 8 because it has a happy ending and it was funny. I loved the book because it was fun to read. I thought the pictures were well illustrated. Kevin rates this book 5/5 and writes: The cat’s eyes are creepy. If I had a cat, I will be excited and call her Mrs. Fluffy Slippers. The cat found a good owner. Does the cat like shiny shoes? I think why they call her Mrs.Fluffy Slippers is because she loves slippers. The cat had a reason to choose a right owner. She doesn’t like boots or shoes. She only wants slippers and shiny shoes. Heman rates this book 3/5 and writes: My favourite part is when Slippers found an owner. I liked the cowboy boot with the snake on it. I liked the part when Slippers was riding on a motorcycle. Slippers got lost because Mrs. Fluffy Slippers forgot him when she went to live with her daughter. I liked the pictures. The pictures show only the shoes. Grace rates this book 2/5 and writes: The picture with the fire and the cat was very powerful. The kitty cat looked very realistic. My cat kind of looks like that. This book is very cute. It is okay. It was nice but not that exciting. the problem is too easily solved. I would like to read a story with not a really happy ending sometimes. This entry was posted in BLG Reads this week and tagged BLG Reads, C. Roger Mader, fiction, picture books by carriegelson. Bookmark the permalink. Your students’ comments are awesome! I especially love the 8/5 rating and the motorcycle comment. I am a sucker for books about cats. We’re usually draped in cats during story time around here, so it seems highly appropriate to read about them! I’ll have to look for this one. Love the cover art! The illustrations really are stunning – the cover art certainly lures you in! I love how everything is drawn from the cat’s perspective. Ratings for this book were all over the map. Some kids found it comforting and amusing. Others wanted more action. All loved the pictures! This is so cute! I love the different ratings and how you can really see each one’s personality. As someone with a literary blog, I love that you are inspiring others with books! My students are becoming better and better at articulating their opinions! I am always truly amazed at how articulate your students are, Carrie. I love to read their comments! Thanks Heather. They are really learning to express their opinions and reactions to the stories. I am so pleased with all of the progress! Hi Carrie (Mrs. Gelson) & hi to all the student reviewers! I’m going to need to find this book to see what I think about all the many details you shared. It makes me curious to read the whole story because each of you shared different details. From the cover I can see that the pictures must be beautiful! Thanks for sharing all your opinions!